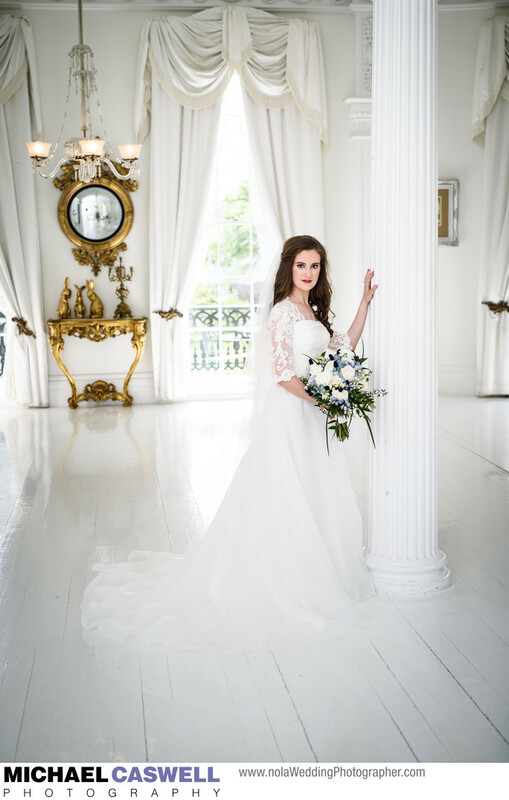 Nottoway Plantation on the Mississippi River in White Castle, LA is a well-loved wedding venue in south Louisiana. It's located about 30 minutes south of Baton Rouge, or an hour and a half west of New Orleans, but it's well worth the trip, both for weddings and for bridal portrait sessions. While there are numerous great spots on the spacious grounds and inside the home for pictures, the mansion's famous White Ballroom looks like it was tailor made for photographing a beautiful bride. With its signature and instantly recognizable gleaming white floor, it was in fact intended by the original owner of the property to serve as a space in which to celebrate the marriages of his beloved daughters. The graceful and elegant home was built in the 1850s, and although ownership of the property changed hands several times during the 1900s and eventually fell into disrepair, since the early 2000's it has been beautifully restored and has functioned as a successful tourist destination, museum, restaurant, resort, and event venue. Ample on-site accommodations are available, as are numerous amenities for wedding ceremonies and receptions. Nottoway Plantation can serve as a location for a small wedding or elopement, or a huge gathering with several hundred guests. Location: 31025 LA-1, White Castle, LA 70788.